An ischaemic stroke – or acute ischaemic stroke – is when the blood supply to your brain is cut off or severely reduced. This can happen when an artery or a small vessel deep inside your brain, is blocked by a blood clot or clump of fat. This starves your brain of the oxygen and nutrients it needs, which damages your brain cells. The sooner you get treatment for an ischaemic stroke, the less damage is likely to happen. There are different types of stroke. 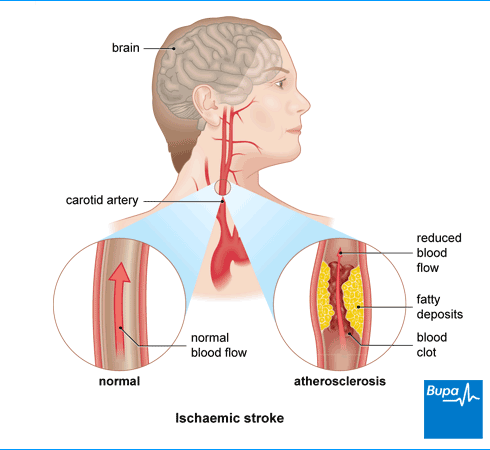 This topic is about ischaemic stroke and we also have information about haemorrhagic stroke. Ischaemic stroke is the most common type – about 85 people out of every 100 who have a stroke have this type. And there are two different ways that it can happen. Arterial thrombosis (also called thrombotic stroke or cerebral thrombosis). This is when a blood clot forms in an artery that supplies your brain and blocks the blood supply. Cerebral embolism (also known as an embolic stroke). This is when a blood clot forms somewhere else in your body and travels to your brain and severely reduces or blocks the blood supply. The clot usually forms in your heart or one of the large arteries that supplies your brain. An ischaemic stroke is caused by a blood clot or clump of fat blocking the flow of blood to your brain. The blockage might start in one of the arteries in your brain or somewhere else in your body. Ischaemic stroke symptoms usually come on suddenly, within seconds or minutes. Sometimes you can have a transient ischaemic attack (TIA) before a full-blown stroke. See our Frequently asked questions below for more information on TIAs. It’s vital that you can recognise if you, or someone you’re with, is having a stroke so you can get immediate treatment. A good way to remember the signs of one is to use the ‘FAST’ test. Face. If you’ve had a stroke, your face may feel weak and you won't be able to smile. Your mouth or eye may droop down, usually just on one side. Arm. You won't be able to raise your arms and hold them there. Time to call 999. If you have one or more of these symptoms, or you see them in anyone else, get emergency help straightaway. Other symptoms of an ischaemic stroke depend on where in your brain the blood supply is blocked. This is because different areas of your brain control different things and they all get blood through different arteries. When you get to hospital, you’ll have some tests to find out what type of stroke you’ve had and how your brain is affected. This will help your doctor to plan your treatment. Later on, you may have some other tests on your heart and blood vessels to try to find out what caused your stroke. These may include the following. an angiogram, to help see the blood supply to your brain in more detail. In this test, your doctor will inject a dye into your blood vessels to make them show up on X-rays and scans. You may be treated for an ischaemic stroke in a specialist stroke unit in hospital. If you can't swallow, you’ll be given fluid through a drip in your arm to stop you getting dehydrated. And you’ll have a tube in your nose to give you the nutrients and medicines you need. You might also need some support to help you breathe. Nurses will help you to sit up and encourage you to move around as soon as you can. If you can’t move, they’ll help you to turn in your bed regularly. This will reduce your risk of getting bed sores and deep vein thrombosis (DVT). They may also give you a mechanical pump to use on your feet and legs called an intermittent compression device. The pump automatically squeezes your feet and lower legs to help keep your blood moving and prevent a blood clot from forming. How long you’ll need to stay in hospital will depend on how severe your stroke was, how you’ve been affected by it, and your recovery. For more information about how long people tend to stay in hospital for see our Frequently asked questions below. Your doctor may prescribe you the following medicines for ischaemic stroke. Alteplase is a medicine that can break up blood clots, and will help restore the blood flow to your brain. You’ll need to have it within four and a half hours of your symptoms starting for it to work but the sooner the better. Alteplase isn’t suitable for everyone – ask your doctor if it’s an option for you. Antiplatelet medicines like aspirin can reduce your risk of blood clots forming after a stroke. For more information about aspirin, see our Frequently asked questions below. Anticoagulant medicines such as direct oral anticoagulants or heparin can also prevent blood clots forming. Statins, can help to lower your cholesterol. Your doctor might also prescribe you some other medicines to control your blood pressure and lower your blood sugar level. If you have a blood clot in a vessel leading to your brain, you might need to have a procedure to remove it with a mechanical device. This is called a thrombectomy. In this procedure, your doctor passes a tube through a small cut in your groin into the affected artery. They thread this through to reach the clot and use a device to remove the clot to allow blood to flow to your brain again. Ask your doctor for more information about the procedure and if it is an option for you. A stroke can damage your brain. Since your brain controls everything you do, you may need to relearn skills and abilities, or learn to adapt to new ways of doing things. This is known as stroke rehabilitation. It can be difficult to know how well you’ll recover from a stroke. You might make most of your recovery in the first weeks and months after the stroke. But you might continue to get better and carry on improving for years afterwards. A multidisciplinary team of health professionals will work out a rehabilitation programme for you that’s designed around your needs. The team may include physiotherapists, speech and language therapists, occupational therapists, ophthalmologists and psychologists. They’ll work together to help you stay as independent as possible. If you have a health condition, such as high blood pressure, it's important to get treatment to keep it under control. Likewise, if you have high cholesterol, treatment for this may lower your chance of having a stroke. See Related information for tips and advice on achieving these. Once you’ve had an ischaemic stroke, your doctor may recommend you take medicines to prevent having another one. This might be a type of medicine called an antiplatelet, such as clopidogrel, aspirin or dipyridamole (or a combination of two of these). Or they might suggest you take anticoagulation medicines such as warfarin. The type of medicine you take depends on what caused your stroke and your personal circumstances. Ask your doctor for more information. Can taking aspirin prevent an ischaemic stroke? Can taking aspirin prevent an ischaemic stroke? Aspirin is a type of medicine called an antiplatelet, which means it helps to prevent blood clots forming. But it can also increase the risk of bleeding in your stomach and bowel. If you’ve never had a stroke before, the benefits of taking aspirin might not outweigh the risks of taking it long term. It's more important to make changes to your lifestyle, such as improving your diet and doing more exercise. Only take aspirin to prevent a stroke if your doctor recommends you do so. How long do people stay in hospital for? How long do people stay in hospital for? The time you need to stay in hospital after an ischaemic stroke will depend on how severe your stroke was. It’s difficult to say how long you’ll need to stay as it depends on how severe your stroke was and how well you recover. It can be anything from a few days to a few months. Depending on how well you recover in hospital, it may be that returning home isn’t the best solution. Before you leave hospital, you’ll see a team of health professionals, which will include a physiotherapist, an occupational therapist, a social worker and a speech and language therapist. They’ll help you decide how much care you need and consider all available options. If you can’t go back to live in your own home, there are other options, such as assisted living and extra-care housing. Can ischaemic strokes run in families? Can ischaemic strokes run in families? You’re more at risk of having a stroke if another member of your family has had one. But this doesn't necessarily mean that you’ll have a stroke. Your risk depends on factors that you can’t change (such as your age, race and family history) and lifestyle factors that you can. For tips on how to improve your lifestyle, see Related information below. Are TIAs different to ischaemic stroke? Are TIAs different to ischaemic stroke? Transient ischaemic attacks (TIAs) are also known as ‘mini-strokes’. Like strokes, they happen when the blood supply to your brain is interrupted, but with TIAs, it’s just for a short time. TIAs happen when a clot blocks your blood vessel. But unlike an ischaemic stroke, the clot quickly breaks down or moves to allow blood to flow again. They still cause stroke-like symptoms but they usually won’t last for more than 24 hours. In fact, most TIAs last less than an hour. Some people have a TIA before an ischaemic stroke – usually a couple of days before – so if you notice any symptoms, get emergency medical help. Treat this as a possible warning that you’re at risk of a stroke so you get the help you need.